Posted on December 20, 2013, in holiness, liturgy and tagged cassocks, clericalism, daniel p horan ofm, extraordinary form, new priests, pope francis. Bookmark the permalink. 33 Comments. 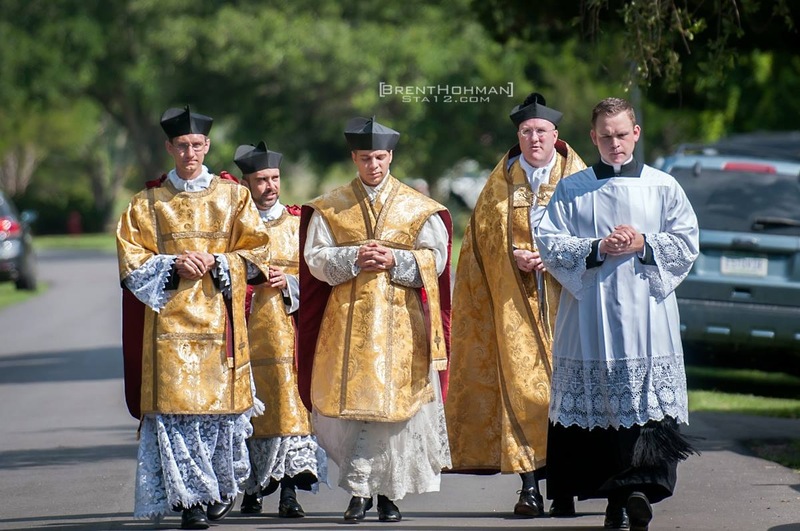 I love the terrific traditional young, holy and reverent priests I have been blessed to know. These guys are out there with people, joyous and unpretentious. – Reverence is NOT clericalism! If some goofy, malformed and wayward liberal priest is feeling an inferiority complex (i.e. Fr. Horan), and wants to follow the worldly footsteps of the Alinskyan dinosaur priests of the 1960’s & 70’s, that’s his problem. Thank you for your comment. Even our holy priests can be lacking at times in an understanding of the challenges facing the Church. Let’s offer some prayers, rosaries and Masses for Fr. Horan that he may learn to recognize the reverence and goodwill in many of his brother priests. I would love for Fr. Horan and others with a similar mindset to realize the harm and scandal caused by attacking other priests simply for their attempt to restore orthodoxy and reverence. Thanks for this article. The traditionalist priests that I have come across have all been well spoken, well educated and greatly enthusiastic about the Faith. They are generally delighted by young people like myself approaching and loving the Old Mass. Some of them have suffered for their love of the Church, and if they were concerned with ambition and career advancement, they would have done better to remain run of the mill and not shake things up. Excellent observation Charles! God bless. I would echo Charles Milligan’s comment, “The traditionalist priests that I have come across have all been well spoken, well educated and greatly enthusiastic about the Faith,” while adding, “and generally lacking in pastoral skills.” This is why they can come off as aloof to parishioners. Like it or not, this is where people are at because of their “poor formation” and somehow this gap needs to be closed before “the dignity of their priestly vocation and the beauty of the Catholic faith” gets its due. Good comment Paul. I would only add that I don’t believe it is an either/or when it comes to the restoration of the sacred and reverence, and the need to be pastoral. Both need to be done. Part of my motivation for writing this post was to help highlight that reverence is not clericalism, regardless what some might think. We need to help educate our fellow Catholics of this. We also need to encourage them to display patience and charity toward these younger priests as they get their “pastoral legs” under them. This post, for me, is the epitome of the “clericalist” mindset, to wit: The Church is hierarchy; and, the hierarchy is Priests . . . and, that’s pretty much it. Deacons are NOWHERE mentioned above . . . yet, they, too, are clerics. Bishops also — astoundingly! — get NO MENTION WHATSOEVER . . . yet, the Bishop possesses the fullness of the Great High Priesthood of Our Lord, God, and Savior Jesus Christ. Let’s remember what the Rite of Ordination says about “Clerics” (i.e., Priests): They have been chosen out of the People of God for Priesthood; they are ordained for service; they are sharers in Christ’s Priesthood only through the Bishop; they are ordained to the second rank (! ); they are made to promise obedience to the Bishop. Let these young Priests be reverent! Amen! Let them love and celebrate the “Old Mass”! God bless them! But, I can also not forget that I have met too many Clerics who love the old forms who were meanspirited, Pharasaical, and anti-layperson. They thought that being a Priest meant always being right . . . about everything. Fr. John Zuhlsdorf is a prime example. I’m not surprised that he picked up on this blog post. Thank you for your comment Cephas. The post was primarily written to address Fr. Horan’s column and those with a similar viewpoint. This narrowed the focus to addressing the clericalism charge directed specifically against young priests; therefore I did not discuss bishops or deacons. Your comment regarding Fr. Z and the all too familiar “Pharisaical” accusation speak volumes. I would respectfully ask that you also read both Fr. Z’s post from December 20, as well as Fr. Trigilio’s excellent response to this same topic back in October. “Your comment regarding . . . the all too familiar ‘Pharisaical’ accusation speak[s] volumes.” True, . . . about my own personal experience (and, I would gather, of others, too). I’ve met too many Clerics who use the “Old Liturgy” as a channel for their own desire for control. On the flipside, I’ve met many Clerics who use the flexibility of the “New Mass” (ugh!) as an outlet for their need to be loved and respected. The problem, then, for me is NOT the liturgy or a lack of reverence: The problem is centered precisely in the psychologies and spiritual life of those Priests who believe that being a Priest means being the center of attention, whether in the “Old” or the “New” Eucharistic ritual. Your blog post is spot on Father Trigilio. I think this us a very timely and necessary conversation to have. I hope responses like yours and mine constructively change hearts and move the dialogue forward. There are far too many orthodox young men currently in seminary who should not have to face this type of mistreatment upon ordination and assignment. Thank you for reading the blog Father and look forward to future comments. On a side note, we also have excellent (and thoughtful) discussions at the Facebook page for Liturgy Guy. Please consider joining. Thank you for this post. I have some comments. First to say that I am a seminarian close to ordination and I can talk from a “bit” of inside experience, but this is only my opinion and nobody else’s. I can see both sides of the coin, but I have to say that my experience in different seminaries is that SOME (many sometimes) young seminarians / soon to be priests LOVE clericalism and strive for it. I can see it especially in young seminarians as opposed to second career seminarians. I am sorry to say that I have seen this many many times and I don’t like it. I have also met many newly ordained priests who wear cassocks just because people will treat them as if they were above them (literally I have heard this many times) and I have to say that I don’t like it. That should not be the reason to wear one. I have also experienced older priests who criticize all of this, putting all young newly ordained priests under the same umbrella and this is not right either. The fact that a newly ordained priest has a “shy or standoffish” way of interacting with people is not due to clericalism but rather to a lack of experience (for lack of a better term). So yes, I have experienced both: young newly ordained priests who want to go up the ladder fast and want people to treat them as kings and also amazing young newly ordained priests who are sooo amazing but a bit introvert and get confused by being stuck up or conceited when they are not. Sorry to play devil’s advocate in a way, but this is just my humble opinion and my experiences. I keep on meeting seminarians that all they want is to become bishops right away so they work the way up by only talking or interacting with higher positions in the church (bishops etc) and this translates in the way the act as priests later on…. they won’t be interested in the people but rather in impressing the bishops and other important authorities in the clergy. As you are as a seminarian that’s how you most likely be as a priest. This starts in formation earlier in seminary. Again sorry if this sounds harsh. I don’t want to criticize or speak ill of anybody. Not my intention at all and maybe it was a bit off topic, which I hope not, but I thought it was worth exploring where all of this is coming from. Thank you for your comment Gregorio. I too have been blessed to know seminarians as well as recently ordained priests. In my diocese these are some truly amazing young men who seek to serve the Lord and the laity. I have also met many people who oppose a recovery of tradition and orthodoxy and who resist change under this charge of clericalism. We have seen many from the VCII era generation who virulently oppose the Extraordinary Form, Latin in the OF, priests wearing cassocks, etc. Young men will occasionally suffer from an unhealthy pride, no doubt, whether their vocational call is to the priesthood or marriage. However, it is not the crisis that “progressive” Catholics claim. As I said in the piece, “clericalism” for many is simply a spurious charge made against those priests righting the mistakes of the prior generation. On young priests : They are young. Youth breeds idealism. This is not a bad thing. They want to do everything the way they have been taught and believe God wishes. The youth are also a little defiant. So their defiance (which is not bad as long as they are being reverent and following the Church) will be seen as bad and appear as clericalism. They will look like young whippersnappers who don’t know about “how things are done in the real world”and look like they are showing up their pastors. Well said. I think this may indeed explain some of the perception. I also believe that many who embraced the “egalitarianism” of the 70’s & 80’s, when seminaries emptied and the priesthood was depleted and scandalized, choose to attack orthodoxy with this charge. Those who extol the laity by diminishing priests. I have experienced vibrant young priests eager to serve the Church faithfully and with fidelity to the Magisterium and the Liturgy. I have also encountered young priests with a little chip on their shoulder about being priests. It’s not a formation issue, it’s a maturity/ego issue for some. No matter how faithful they are, if they’re not humble they can chase souls away from Heaven. A priest’s pastoral skills should be a measure of how well he charitably lives and proclaims the Gospels and Church teaching w/o watering down the Faith. Unfortunately it seems for most Catholics, pastoral skills means championing ‘social justice’ as the world understands it and avoiding or dissenting against Church teaching. I don’t want my priest to be my buddy. Priests are meant to be are spiritual leaders leading us to Heaven. There is wisdom in the Church’s policy of regularly transferring priests from parish to parish. It prevents laymen from becoming to familiar with their priests. So the charge that priests are ‘aloof’ is bogus. Clericalism is hardly the serious problem in the Church that the Pope paints it to be. Compared to what?…Youth unemployment and loneliness of the aged? Please. This Pope is fond of creating situations where they hardly exist, or if they do, not as serious as he makes them to be. Latest diatribe on the “likely temptation” our Lady may have experienced at the foot of the Cross…”Didn’t the angel tell me that He would inherit the throne of David, so why this, etc., etc?” Which, if true, is really academic, since it’s obvious that Our Lady did not succumb to such temptations. Why discuss them at all? So stop the debate now. Sometimes I believe the Pope is suffering from an over-active imagination that is not always a good thing. Don’t blame his Jesuit-training for it. I’ve known and read of Jesuits with more sense than this Pope. It’s an insult to lump Bergoglio with such sensible men as Frs. Fessio, Pacwa, even the late Malachi Martin, and especially the saintly Fr. Hardon. Pope Francis is a nightmare, but don’t worry, the Church and the priesthood will surely survive him. Merry Christmas. Fa la la la la! As someone who this very year has rediscovered the Tridentine Mass, I find I have to be so very careful how I share this with others, because, although not a priest, it too can smack of “I am a good Catholic and what are you” if I am not careful. Similarly with my Protestant Christian family and friends, or those of other or no religion, to share what I believe is the fullness of Christianity (the Roman Catholic Church) and yet do it in a way that does not question nor take away from their spirituality is equally tricky at times. But God deliver us all from our own versions of clericalism, and may we remember it is far better to be the Prodigal than the older brother looking on! For that is what we are if we ever, ever place ourselves above the “least of these.” WE are the least. Very good article. Merry Christmas by the way! I always appreciate your comments and insight Richard. Well said. God bless and Merry Christmas! And that goes both ways! God bless you friend! I know this is an older post, but I wanted to just suggest that perhaps there is a mixed bag of truth behind all of this. I love the Latin Mass, and the traditions of the faith, and know some great priests, but do we ever wonder if there is a reason why tradition is not coming back faster? Tradition is great, but there is a tendency amongst some traditionalists to be self-protective, and to be “stuck” in the mechanics of tradition as if they were the end all…and naturally, when this happens, the beauty of faith gets “stuck” as well…corroding away. With the Holy Spirit, the traditional Catholic Faith is more powerful, beautiful and uplifting than other. Without it, it is more corrosive and damaging than any other. This is perhaps why one traditionalist who lacks warmth can turn away more people often than twenty non-traditionalists who are just as cold. Without the spirit, the letter (tradition) becomes a paralyzing, horrific knife to the soul. With it, it is a heroic sword that can change the world. If everything is so great in the Church, especially with the young clerics, why have Confessions dropped off?? Where? Not in my church, which has three usages/forms of the Roman Rite (OF, EF, Anglican Use). I know, my church is probably an exception, but the exception proves the rule. Confessions drop off because…and this is my opinion from observation…Priests are not available for it (or are not available when people are there, or would/could be there), don’t charitably preach it, don’t URGE it, and don’t personalize it by setting the example by telling their flock how important it is in THEIR spiritual life. Marietta! Are you still a Catholic and treat the vicar of Christ,chosen by the Holy Spirit, like that ? Shame!!!!!!!!!!!!!! Excellent article! Thank you. I am 42 years old and grew up with bad liturgy, bad music, and terrible catechesis. Love seeing the “smells and bells” – we have it at the parish I work at here in Gilbert AZ, including, an Ordinary Form in Latin once a month. Yes, yes! Most of the newly ordained Priests are so beautifully into their Priesthood, are more reverent but also speak the “Truth” when called upon. They are the young lion’s that the Catholic church has desperately needed for the past fifty year’s or so. These young lion cubs will have the backing of the Holy Spirit but also more Catholic’s who welcome the Traditional Mass. Our church has lacked the “holiness & reverence” for so long that it might take another fifty yrs. to undo the damage! We love our young holy priests! God is Spirit, and those who worship Him must worship in spirit and in Truth 24/7. Not only when we catholics ‘feel good’ in a traditional Mass.